As I (literally) single-handedly type this post with my right hand, my left hand is stuffing my face with a "Cheese Ploughman's" sandwich from the Department of Engineering cafeteria which tastes like an odd mix of... really odd things... There are no words. But I was desperately hungry, and the sandwich along with 2 mandarins did only set me back £2.70. In essence, I am eating to live. With each bite of this sandwich, I am tempted to wave the white flag and surrender to my hunger, but my stomach won't be too happy. And so I soldier on. Yes, I have made a few war references. This is because, in my mind, I am at war with this awfully mediocre sandwich. Sometimes I have chocolate cake cravings. They can be very strong. This particular time, I remembered that I had some Haagen-Dazs vanilla ice cream in my freezer. Once the thought was there, it grew and grew. Chocolate cake. Must. Have. Now. Since I didn't feel like baking a whole big cake, I proceeded to instead scour the internet for recipes of mug cakes. My literature review was hurried and by no means extensive (unlike the one I did for my PhD), but it did yield a good recipe (from Nigella's website) which I edited to my taste and ended up being pretty darn tasty! Mix the flour, sugar and cocoa powder in a small bowl. Add in the milk and melted butter, and mix well. Beat the egg lightly with a pinch of salt in a separate bowl, and add to the cake mixture. Microwave one mug for 1 minute (for 700 watt microwave). Serve topped with a generous scoop of vanilla ice cream! Yes - we were laughing. Because, being fresh off the boat (so to speak) from Melbourne, here was an up-and-coming cafe with all the promising hallmarks of a truly crowd-pleasing Melbournian coffee institution! 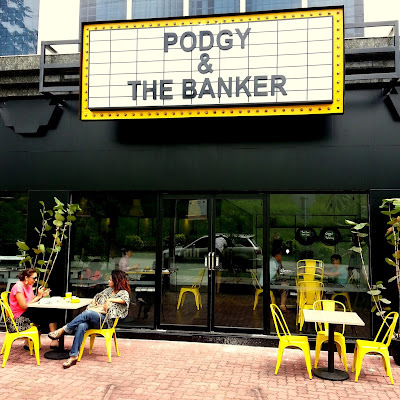 From the nifty workshop-style lights and furniture, to the unfinished concrete counter, to the cute yellow and black cups and saucers, Podgy & The Banker had really gone to town with the now trending hipster cafe fit-out. And with great success at that. Next test - the coffee. So KL seems to be currently experiencing an explosion of coffee-mania (coffee-fever, coffee-delirium, coffee-hysteria, etc. you get the picture). I kid you not. It is quite a spectacular explosion and one to be watched very closely. I still haven't yet decided whether it is a subculture that will transcend generations, or if it is merely a passing fad akin to the recently trendy-and-then-not-so-much-anymore cupcake and macaron obsessions. Regardless, Podgy & The Banker serves up a pretty decent cuppa (my benchmark being a mocha - coffee aficionado, I am not). However, my brekkie companion, SR, who is much more of a coffee fan than I am quite enjoyed her flat white - so we must be on to something here. So far, a tick for the ambiance and the coffee. Final item on the checklist - the food. Being only about 1 week old, the food menu was fairly basic - eggs poached, scrambled, or made into an omelet, and 3 sandwich offerings. With great trepidation I ordered the chicken and avocado sandwich. The thoughts running through my mind - is this even breakfast food; I hope to God that it's not Gardenia bread; will the chicken taste weird; avocado, in Malaysia? Yes, I was preparing myself for the worst. But I needn't have stressed out because the sandwich arrived and to my delight, went down a treat! Great bread, well-poached chicken, fresh avocado, soft melty cheese and just the right dollop of mayonnaise all came together in one lovely grilled sandwich. I couldn't have asked for more. SR's poached eggs with ham was also quite a success - the egg yolks nice and runny, and the ham (probably chicken) full of flavour. Served again with the yummy bread, toasted. 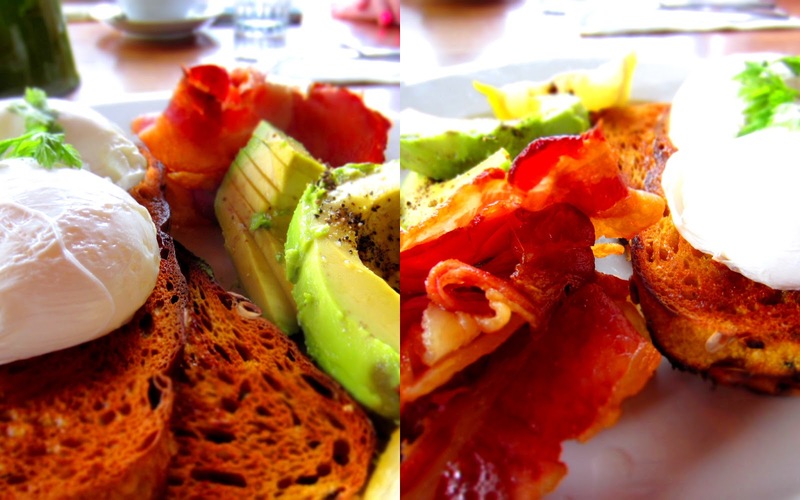 A tick for the food, and bonus points for satisfying my avocado craving in the most fulfilling fashion! By the end of the meal, SR and I were very happy campers indeed. 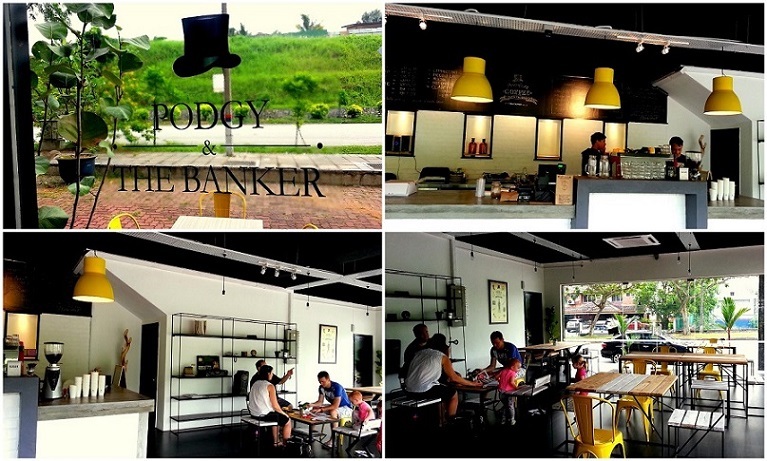 Teething problems (unpolished silverware and dusty glasses) aside, this cafe is the closest thing to hipster Melbourne that one can find in KL. Seriously. The other joints don't even come close. So check it out for yourselves if you have the time! Finally! We have travelled through time from the latest undocumented BC meeting at Two:bob to our most recent one at The Premises in the quaint and lovely suburb of Kensington. So anyway, finally arrived at (the correct) final destination, and joined DS, AA and BNL at the communal table. This cafe, like Common Galaxia, had a truly intriguing centrepiece in the middle of the table! Think quirky but endearing combination of chemistry apparatus and botany. EP was yet again missing in action from this BC meeting. But not to worry - he definitely shall be making an appearance at the next one as we have issued him a warning that missing another BC meeting would cause him to lose considerable brownie points (that may one day be redeemable for actual brownies). No, not really - I made that up. But it is never good to lose brownie points. Me and the other BC members can only hope that he heeds this warning. 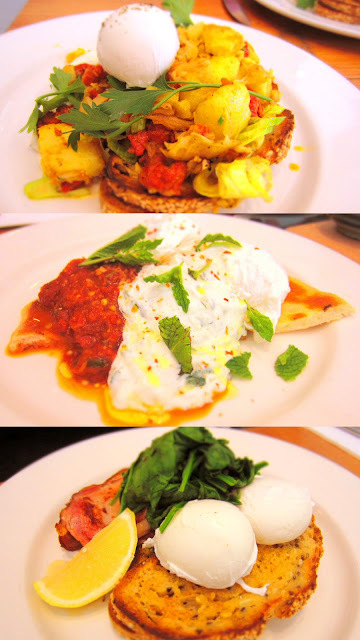 About the food - I must say that I like the presentation of the dishes at The Premises the most out of all the breakfast places I have been to (except for perhaps The Hunter at Twenty and Six Espresso in North Melbourne that looks like the movie set from Narnia). Check out the pics - and yes, the food tasted as amazing as they look! Located in the lovely suburb of Seddon, the first thing I noticed in this cafe was the wonderful centerpiece in the middle of the large dining table. I loved it! It was like a mini-rainforest in a giant fish bowl (yes, I do have a way with words... poetry some would call it..). Common Galaxia is the name of a unique fish that lives in the Maribyrnong River, near where this cafe is. I thought it slightly odd that the cafe also serves a dish containing said fish.. It felt almost cannibalistic... But that's just me, and that is the only thing I found odd about the place. Everything else was quite lovely and hipster-y. This venue had been chosen by EP, who didn't end up attending the meeting due to other (obviously more important) commitments. Tsk tsk. But since the food was so yummy, we forgave him and moved on with our lives. At this point, I am not going to even try to wax lyrical about the food and instead (as I usually do when hard-pressed for time) let the pictures do the talking. 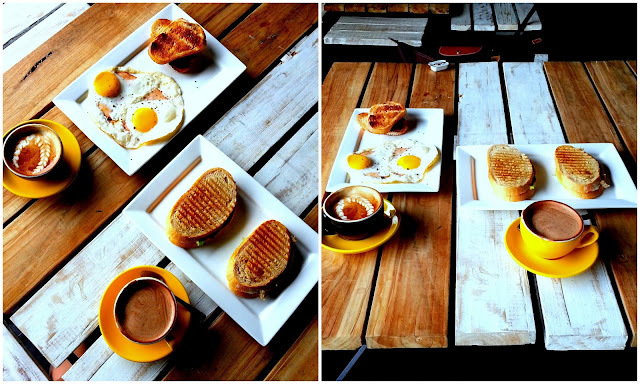 Breakfast Club Diaries Part 1 - Got a bob (or two)? Firstly, apologies for the uber ginourmous gap between my last post and this one. I have been busy having a life... *coughpartyanimalcough* Well, no not really - but I have been involved in a number of interesting undertakings that have taken up a lot of my time over the past few months, the details of which I shall not bore you with. So yes, here we are! BC meeting #5 was at Two:bob, a pretty simplistic, hipster-type cafe in Clifton Hill. It was recommended by B Ninja L (BNL for short), who had taken on his turn as BC meeting recommender with a great sense of responsibility and solemnity, having extensively researched and trialled multiple breakfast venues before deciding on Two:bob as the location of our next foray into the (mouth-)watering and wonderful world of breakfast food. Housed in what seemed to be an old post office or bank, Two:bob's high ceiling, tall, arched windows and white and beige wooden furniture presented a bright, open dining area perfect for a cheerful and cosy catch-up with friends. The service was prompt, yet friendly - this was the day that the new iPhone5 had been released and our good 'ol Apple afficionado, Nintendo DS, had just collected her shiny new phone - much to the delight of our (very hipster) waitress, who ooh-ed and aah-ed over it for a good few minutes after taking our coffee orders. I had ordered the omelet with pork and fennel sausage with the oh-so-delicate buffalo mozzarella that came sprinkled with some rocket salad and the optional spicy tomato relish on the side (which our waitress insisted was the perfect accompaniment). She was right! I loved this dish - my only regret was that my stomach wasn't big enough for me to completely smash the meal. I slowed down considerably towards the end, but with great perseverance managed to polish the plate clean (so to speak!). The relish was indeed the perfect sweet and tangy accompaniment to the omelet. EP ordered the big breakfast (the most blokey dish on the menu) that came with poached eggs, pork sausages, bacon, grilled tomato, mushrooms, potato rosti and onion jam. If you had just spent a month fighting a raging war in some obscure corner of the world and returned to Melbourne, this is what you would have ordered to fill your roaring belly. Perfectly poached egg, accompanied by the assortment of sides that had been so well prepared, there really was no fault to find with this dish. So this post should really be called Jamie's 1-hour meal - because that's how long it took me to make it! Oh Jamie, how you make all culinary undertakings look like a piece of cake (and sometimes they actually involve cake). Jamie made it look amazingly easy - he did it in 15 minutes! It looked full of healthy goodness and I definitely needed some after eating like a pig in KL! But I was determined to give it a go. So after hunting down ALL the ingredients (no compromises at all), I was ready to embark on my supposed 15-minute meal-making journey. Alas, it was not to be (15 minutes, I mean) :( 15 minutes after setting out to make my meal, I found myself still peeling my spring onions, and then peeling my mango, and then freaking out because my quinoa hadn't cooked in the 8 minutes that Jamie said it would. Oh life - why can't you ever be even the teeniest bit like what we see on TV? I kept the quinoa, chicken, and capsicum separate and only assembled my salad in single serve portions. You'll be glad to know that the quinoa mixed with the herbs keeps well in the fridge for a few days and still maintains its lovely green colour. All components can be easily reheated (stove/microwave/oven). OH and also, I think the salad would work just as well with firm tofu replacing the chicken - blackened tofu! Yummayy. Put the quinoa into the pan and generously cover with boiling water and the lid. Put the chilli, spinach, trimmed spring onions and coriander (reserving a few leaves) into the processor, tear in the top leafy half of the mint, then blitz until finely chopped. On a large sheet of greaseproof paper, toss the chicken with salt, pepper, the allspice and paprika. Fold over the paper, then bash and flatten the chicken to 1.5cm thick with a rolling pin. Put into the frying pan with 1 tablespoon of olive oil, turning after 3 or 4 minutes, until blackened and cooked through. De-seed the peppers, cut each one into 8 strips and add to the frying pan, tossing regularly. Peel and cut the mango into chunks. Drain the quinoa and rinse under the cold tap, then drain well again and tip on to a serving board or platter. Toss with the blitzed spinach mixture, squeeze over the lime juice, add the extra virgin olive oil, mix well and season to taste. Sprinkle the mango chunks and cooked peppers over the quinoa. Halve and de-stone the avocado, then use a teaspoon to scoop curls of it over the salad. Slice up the chicken, toss the slices in any juices and add to the salad. Crumble over the feta, scatter over the remaining coriander leaves and snip over the cress. Serve with dollops of yoghurt.